• In this story from India Development Review, author Pratima Joshi investigates the Swachh Bharat Mission, an initiative of the government to work toward a clean, open-defecation free India by 2019. She finds that the mission has largely been a success, but the gaps within the program indicate how nonprofits, businesses, and government can finish the job. • What can philanthropists learn from SBM? What is applicable to causes other than sanitation? What advice would the director of SBM give to a philanthropist beginning a similarly large-scale initiative? • To learn what one research project taught us about SBM, click here. The Swachh Bharat Mission (SBM) … was launched on Oct 2, 2014, with a larger vision of a clean India. The critical aspect of the mission was that—unlike many of the movements that preceded it—this had a measurable outcome (making India open defecation free) and a firm timeline (by 2019). 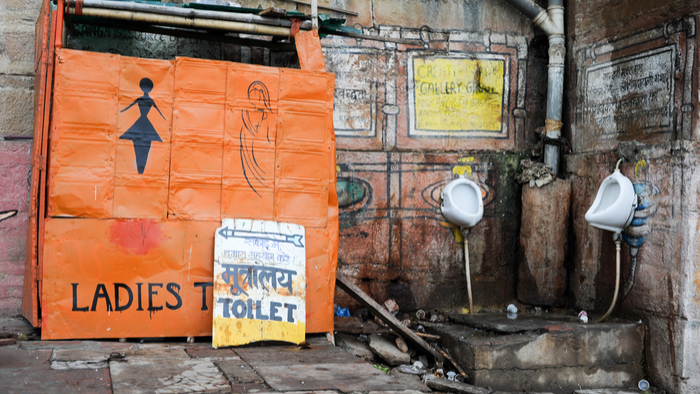 Having a mandate like this from the government gave nonprofits already working in the field of urban sanitation a major impetus, since prior to this it was a space largely neglected by policy makers. One of the major drawbacks has been the absence of use of granular spatial data to make informed decisions and plan targeted interventions. Giving Compass' Take: • Grantmakers In Health provide a PDF guide to impact investing in health to help investors direct their money effectively. • Is impacting investing right for you? What are the advantages of investing? • Read more about impact investing in the Giving Compass magazine. Grantmakers In Health’s 2011 GIH Guide to Impact Investing offered a framework to help funders think strategically about the potential of impact investing and move forward with investment strategies that could enhance achievement of their missions. It gave examples of nontraditional funding techniques and provided a framework for considering new types of investments. The report was grounded in the view that impact investment strategies offer funders tremendous power to shape, accelerate, and scale up desired results, and as such are an effective means of leveraging scarce resources. This update builds on the 2011 report with new information about the growth of the impact investment field, case studies of recent innovative investment techniques and projects, and an appendix on terminology, investment portfolio approaches, and strategies for financing impact investments. Since the term impact investing was first coined 10 years ago, the market for these investments has grown to about $60 billion. Projections estimate the impact investing market to be $400 billion to $1 trillion by 2020, and to be nearly $2 trillion in the long term (GIIN 2016). In the philanthropic sector, there are assets of nearly $800 billion that could theoretically be directed into impact investments. The basic principle of impact investing continues to ring true: through this approach, organizational assets can be effectively used to meet a social mission and serve people in need, while also achieving a financial return. These returns essentially recycle invested funds, which is an important difference from grants, which do not do so (GIIN 2016). Impact investments can be used as catalytic resources, to help provide a proof of concept, or to help scale up a project to the level of traditional investment. They are a demonstrated means for funding projects that might not otherwise receive sufficient capital through traditional grantmaking or market operations (GIH 2011). In the five years since GIH’s original report, knowledge and use of impact investing have spread significantly, and the strategy is no longer in its infancy. An increase in partnerships among sectors, including business, housing, philanthropy, and all levels of government, has accompanied growing recognition of the important role of collaboration for successful impact investments. There is still untapped room for growth, however. Because many potential investors are wary of perceived risks, the number of available transactions remains relatively small. A chief concern for many potential investors is that their investments will profit at the expense of communities. They see a risk that affected groups will not have a say in the development and execution of impact investments, and that impact will be defined by investors and entrepreneurs rather than by the people they are serving (Simon 2014). The case studies in this report illustrate strategies to address this concern. In addition, as a general principle, communities will be served more effectively if funders develop better methods for defining and measuring positive investment outcomes and involve community stakeholders in that process (Case Foundation 2014). Read the full PDF about impact investing in health at Grantmakers in Health.